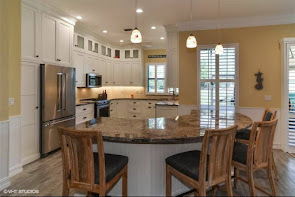 Since the days of ancient Rome, not many materials can beat the classic good looks and durability of ceramic tile countertops. 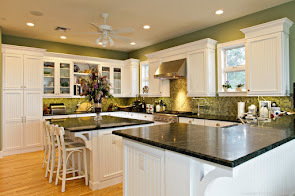 Ceramic tile has an unstuffy charm, is easy to care for, and works well on kitchen countertops. 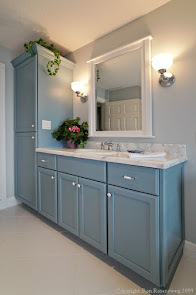 Ceramic tile countertops are durable. Choose acid-resistant porcelain or glazed ceramic tile with a textured or matte finish, and buy grout in a color to blend with the tile. Before purchasing tiles, be sure to check the manufacturer’s recommendations for countertop use. Quarry tile may be more absorbent than porcelain or ceramic tile, making it subject to grease stains. Tiles are fireproof, durable, moisture resistant stain resistant and will not blister, burn, stain or discolor. Tile has excellent abrasion resistance; grout is only moderately resistant, unless sealed. Tile can withstand the heat of a stove or a pan of hot water, but not the thermal shock of a very hot pan of fat. Water rolls off tile, but can loosen grout, and as the grout wears, tiles will lift. Surfaces must be flat or tiles will crack. Buy extras so replacements are from the same dye lot. Tiling a countertop with wider grout joints makes installation and cleaning easier. New acrylic latex additives have improved grout, and are more resistant to cracking, loosening and staining. Use a waterproofing grout sealant every six months, and use a toothbrush to remove the stains that form in crevices. Seal quarry tile with a penetrating oil after it has been laid to build up its immunity to stains. Special nosing tiles can be fitted along the front of a countertop, while special trim tiles used at the back edge will meet the wall neatly. 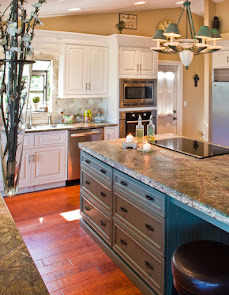 Accent, trim, hand painted and decorative tiles make design choices limitless. 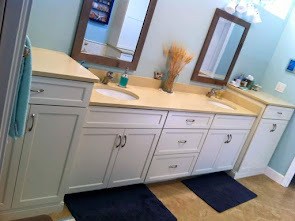 Tiles and mosaics can be bedded into concrete, or stuck directly to a baseboard and grouted in. Use an insert-type sink with a good sealed rim clamped over the tiles, or overlap the sink's edges with curved tiles to prevent seepage. The four main categories of tile are glazed wall tile, quarry tile, paver tile, and ceramic mosaics. 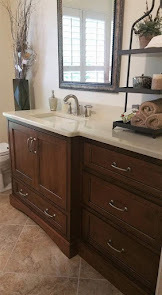 Most tile can be used for countertops, although quarry tile, which can be sealed, is not recommended because of its porousness; it will absorb food stains. Non-vitreous or semi-vitreous tile can be sealed to protect against stains and water absorption; special sealers are available in tile supply stores. 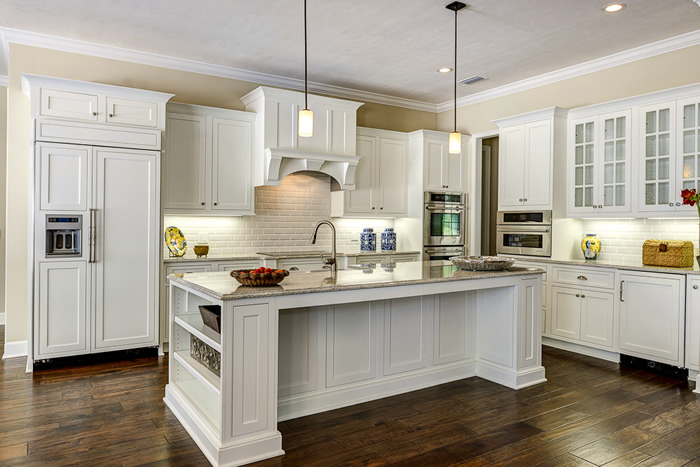 Generally, glazed tile is better than unglazed tile for a countertop. •Glazed Wall Tile. This is a non-vitreous tile with a glaze. 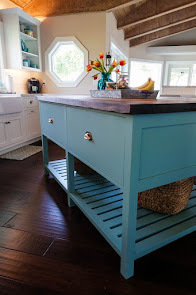 Though inappropriate for floors, it is highly suitable for countertops. It is usually about 1/2 to 1/16 inch thick and comes in 41/4-by-41/4-inch and 6-by-6-inch squares. A sub-category of glazed wall tile is decorative thin wall tile, which has hand painted or silk-screened designs fired into the glaze. It should be used for decorative purposes only - for example, backsplashes - because it lacks the structural strength of conventional glazed wall tile. •Ceramic Mosaics. These are smaller tiles, often 2-by-2-inch squares. 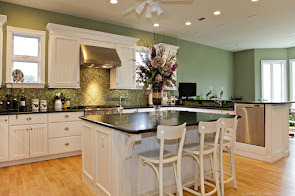 They are available glazed or unglazed, but the glazed versions are better for countertops. They come in square, hexagonal, and rectangular shapes, and often come mounted on large sheets. •Paver Tile. This looks like ceramic mosaics, only the face area is larger than 6 square inches. Sizes range up to 12-inch squares or 4-by-6-inch or 4-by-8-inch rectangles, in 3/8- to 5/8-inch thicknesses. Usually used for floors, paver tile can be used for countertops if it is glazed. Two drawbacks are that fewer trim pieces are available for this type of tile, and that light-colored porcelain pavers tend to stain. •Quarry Tile. This is a semi-vitreous or vitreous clay tile, usually left unglazed. It comes in squares of more than 6 inches and is usually not recommended for tile countertops. 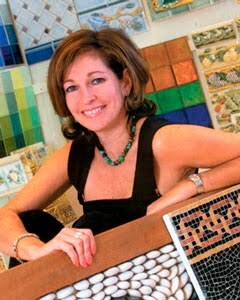 Looking for more information on Tile, make sure to vsit Peri and Lee Newman at http://www.tilemarketusa.com/. Since 1986 Lee and Peri Newman have been building luxury homes in Florida while guiding, designing, and inspiring their clients. Starting with construction, the Newmans laid the foundation for specializing, and setting the standards, for bringing the finest products from the world over for great tile designs and installations. Lee's award winning construction projects and experience is invaluable when assisting builders and installers with on-site design decisions. 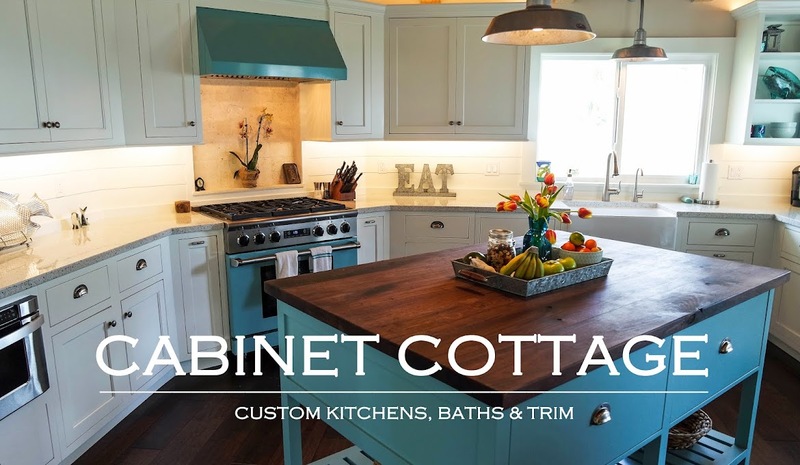 Having over 25 years hands-on experience helps make the planning and preparing details transition easily from concept to what will work best for the homeowner. Peri has worked with South Florida's top design professionals, builders, and installation firms creating unique and special environments for their discriminating clients. 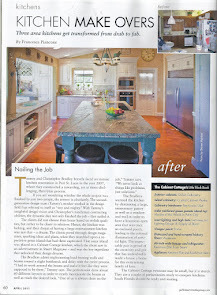 Recently, Stuart Magazine profiled Peri as one of the areas top 'movers and shakers' on the treasure coast. Her product knowledge, constant training with new style elements, and creativity all contribute to successful projects in Florida and around the country. 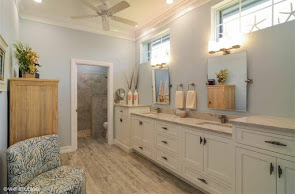 Together, Lee and Peri make a great team representing the finest stones, ceramics, and manufacturers from Country Floors to Walker & Zanger to Pratt & Larson to Oceanside Glasstile and more, Tile Market gives their clients style, choices, and custom residential surfaces beyond all others.